This is a genetically inherited disease that affects Rottweilers. Along with genes, over-vaccination and obesity are the other common causes of this disease. It can range from mild abnormality to extreme dislocation of the joint. The dog could be limping or bunny hopping for a prolonged period of time. A good natural diet with supplements of chondro-protective medications should help your dog fight this disease. It is again a genetic disease, but can also be caused by a bad diet and injury. This disease causes the elbow joints of the front legs being malformed. This is because of the different growth rates of the three bones that form the elbow. This can also lead to osteoarthritis because the malformation damages the bones and cartilages. This problem can be seen when the pup is as young as four months. One of the common symptoms is lameness of the front limb. Your dog might limp; he/she might stop putting weight on the front leg or drag it while walking. They may also hold the diseased leg away from body when they are walking. It is a lifelong problem and surgery is the only cure. In certain cases surgeries are ideal and can get rid of the disease all together. Panosteitis is also known as the long bone disease. It can cause sudden lameness in a growing pup or a young dog between 5 and 12 months of age. This disease can cause alternating lameness in one or more legs. The pain and limping can shift over a period of time that could be several weeks to months. 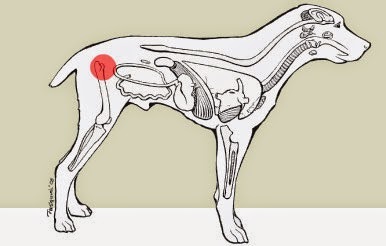 The lameness is caused by excessive bone production in the front and hind legs. It generally effects dogs that are subjected a high protein diet. It can cause inflammation, lameness and limping. Once over 18 months the dogs that are affected from this condition out grow the problem.